Vasai-Virar City Municipal Corporation (VVCMC) published recruitment notice on their official website. There are 135 vacancies for the posts of Gynecologist, Pediatrician, Physician, Surgeon, Radiologist, Anesthetist, Nephrologist, Medical Officer (MBBS) and so on. The details eligibility and application process are given & mentioned in below. वसई-विरार सिटी महानगरपालिका (व्हीव्हीसीएमसी) ने त्यांच्या अधिकृत वेबसाइटवर भर्ती नोटिस प्रकाशित केले. हे पार्वघर जिल्ह्यातील सर्वाधिक लोकसंख्येच्या भाग असलेल्या पश्चिम भारतातील महाराष्ट्र राज्यातील वसई-विरार तहसीलमधील क्षेत्र आणि गावांना प्रशासित करते. हा मुंबईचा विस्तारित उपनगर आहे. स्त्री रोग विशेषज्ञ, बालरोगतज्ञ, फिजिशियन, सर्जन, रेडिओलॉजिस्ट, ऍनेस्थेटिस्ट, नेफोलॉजिस्ट, मेडिकल ऑफिसर (एमबीबीएस), पीएचएन (पब्लिक हेल्थ नर्स), जीएनएम (नर्स) एएनएम, फार्मासिस्ट, प्रयोगशाळा सहाय्यक आणि एक्स-रे सहाय्यकांच्या पदांसाठी 135 जागा आहेत. पोस्ट्स या पोस्टसाठी वॉक-इन मुलाखत आयोजित केली गेली आहे आणि दिनांक 28 जानेवारी 2019 आणि 29 जानेवारी 2019 आहेत. पुढील पत्ता वॉच-इन मुलाखतीसाठी दिलेला आहे. या पोस्टसाठी स्वारस्य असलेल्या आणि त्यानुसार पात्रता निकषांनुसार त्यांनी सबमिट केले पाहिजे तेथे फॉर्म आहेत. खाली पात्रता आणि अर्जाची प्रक्रिया खाली दिलेली आहे. नाव पद: स्त्री रोग विशेषज्ञ, बालरोगतज्ज्ञ, फिजिशियन, सर्जन, रेडिओलॉजिस्ट, ऍनेस्थेटिस्ट, नेफोलॉजिस्ट, मेडिकल ऑफिसर (एमबीबीएस), पीएचएन (पब्लिक हेल्थ नर्स), जीएनएम (नर्स) एएनएम, फार्मासिस्ट, प्रयोगशाळा सहाय्यक आणि एक्स-रे सहाय्यक पोस्ट. 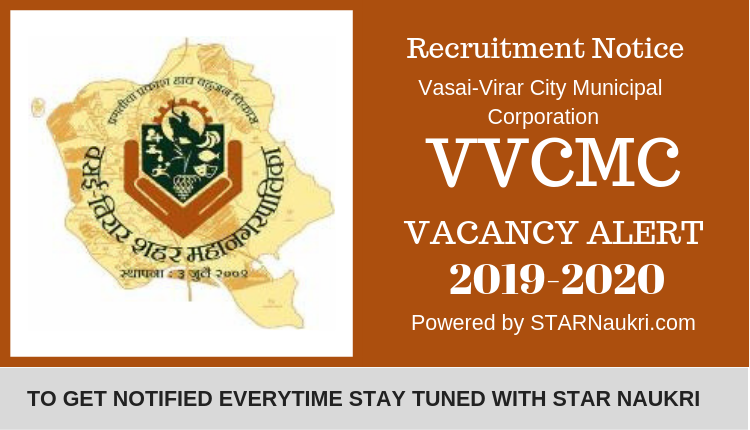 Vasai-Virar City Municipal Corporation (VVCMC) published recruitment notice on their official website(vvcmc.in/vvmc/). It is the civic body that governs areas and villages in Vasai-Virar tehsil in Maharashtra state, western India comprising the most populated part of Palghar district. It is an extended suburb of Mumbai. There are 135 vacancies for the posts of Gynecologist, Pediatrician, Physician, Surgeon, Radiologist, Anesthetist, Nephrologist, Medical Officer (MBBS), PHN (Public Health Nurse), GNM (Nurse) ANM, Pharmacist, Laboratory Assistant and X-Ray Assistant Posts. The walk-in interview is conduct for this posts and the dates are 28th January 2019 and 29th January 2019. The following address is given for the walk-in interview.Those who are interested for this posts and according to they eligibility criteria they should submit there forms. The details eligibility and application process are given & mentioned in below. Name Posts : Gynecologist, Pediatrician, Physician, Surgeon, Radiologist, Anesthetist, Nephrologist, Medical Officer (MBBS), PHN (Public Health Nurse), GNM (Nurse) ANM, Pharmacist, Laboratory Assistant and X-Ray Assistant Posts. Address: Vasai-Virar City Municipal Corporation, 4th Floor, Municipal Multipurpose Building, Ward Committee, ‘C’ office, Virar (East).